The Brush Cutter Used By The U.S. Military! PECO is the kind of American company that believes there is always room for improvement. 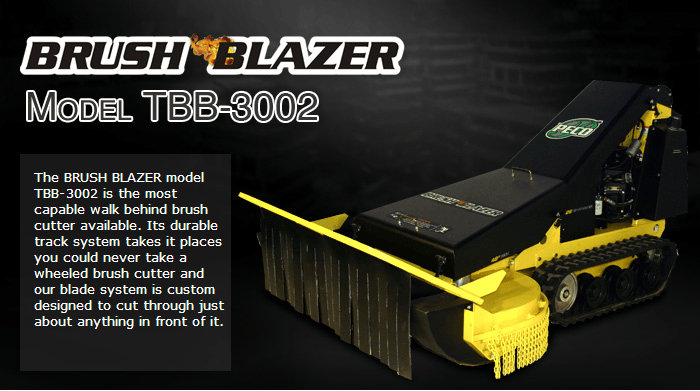 This is why we created the TBB-3002 with some modifications of last years’ model to keep us as the premier brush cutter. We started by eliminating one of the track idlers creating more room for the front axle to move backwards, allowing for a much easier installment of the tracks. We then doubled the strength of our spring to greatly reduce any chance of track slippage. We eliminated the front caster wheels replacing them with our “sled” design which are as durable as a battering ram and also perform better. We then went from the “box” hydro tank to a sleeker version hiding the filter and lines for protection. After all that, topped it off with our new “powder coated” paint creating a more durable and washable finish opposed to our old electro-static paint method.